Originally published by Common Courage Press, Monroe, ME. “I was more deeply moved and ‘sinspired’ by Carolyn Gage’s new book than by anything else I’ve read in years. Like There’s No Tomorrow has qualities rarely seen in current “theory.” It is a work of burning, uncompromising vision and daring… a beacon of hope in these chilling times of compromise, timidity and apparent defeat. This book is Pure Fire. It is true and therefore extreme… a stunning manifestation of Radical Lesbian Feminist Courage and Genius.” —Mary Daly, Radical Feminist Philospher and author of Pure Lust, Gyn/Ecology, and Outercourse. “Many feminists are brilliant, but how many are wise? Playwright Carolyn Gage is a radical lesbian feminist who is wise, as this book demonstrates … uncompromising and tough-minded, yet inspiring… ” --Carol Anne Douglas, off our backs, Washington, DC. “I've had a copy of the manuscript for less than a month, and it is covered with underlined passages and post it notes. Already, I find myself referring to it constantly, incorporating it into what I need to know about the world.”--Elliot, Women’s Books Online. “I am replete or content. I feel as if I have had a most satisfying feast. I have been reading this book off and on for about two weeks, and although I am a quick reader, this is a book to have by your bedside or your favorite chair to think on as you read passages as needed.” -- Mary Atkins, Uppity Women Magazine. Like There’s No Tomorrow takes no prisoners. This is a meditation book that will clear your political sinuses and blow out the cobwebs of fuzzy “live-and-let-live” thinking. These annotated quotations may be read as a series of mini-lectures, as inspirational meditations, or as a Cook’s tour of women’s history. Hot role models! Sor Ines de la Cruz, Chrystos, Sappho, Saadawi—and a host of unsung heroines! Cool strategy! How to lay in for a siege, turn the tables, seize the offensive. Suspenseful stories! Donaldina Cameron’s daring rescue of prostituted Asian girls, Fannie Lou Hamer’s courageous resistance to police brutality, Lillian Hellman’s defiant stand at the McCarthy hearings. Words of wisdom Quotations urging women to hold a grudge, cherish our anger, cultivate our rage, mind other people’s business, and live Like There’s No Tomorrow! These meditations are written with a light touch, but a deep politic. 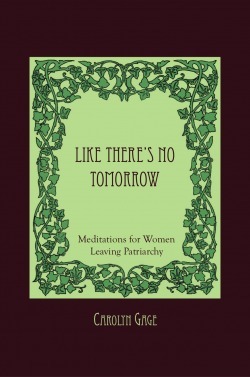 For the woman who finds “one day at a time” a formula for despair—finally a meditation book for those in search of radical healing.